Bug asks: "Mom. Have you ever had amnesia?" My reply: "No. Not that I can remember!" and then we both laughed so hard we almost cried. These are the little moments that I treasure the most as a mom. 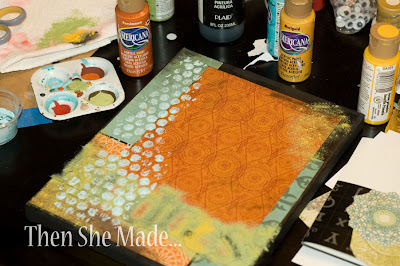 Since I had recently re-discovered my craft stash, I let her dive into it and she settled on making a mixed-media project with some old canvases. 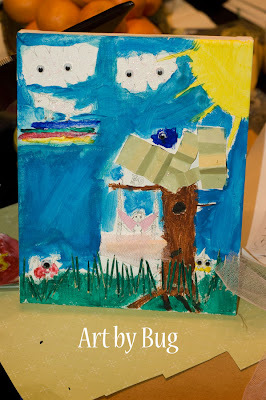 Her art work is above. It's hard to see but it has a squirrel, clouds that are watching everything below. The token sun in the corner and of course a unicorn walking on a floating rainbow. She used crumbled paper for the tree top and painted tooth picks for the grass and then she smeared the heck out of it with glitter glue. I loved watching her create. I personally think there is a beauty that radiates when someone freely enjoys the creative process. When they let go of the worries about trying to be perfect or match someone else's level and they really, whole heartily, just put something out there that hasn't been there before - they radiate beauty when that happens. Bug had that beauty yesterday and I had a front row seat to watch it all. Watching and talking to her during the process inspired me to create too. 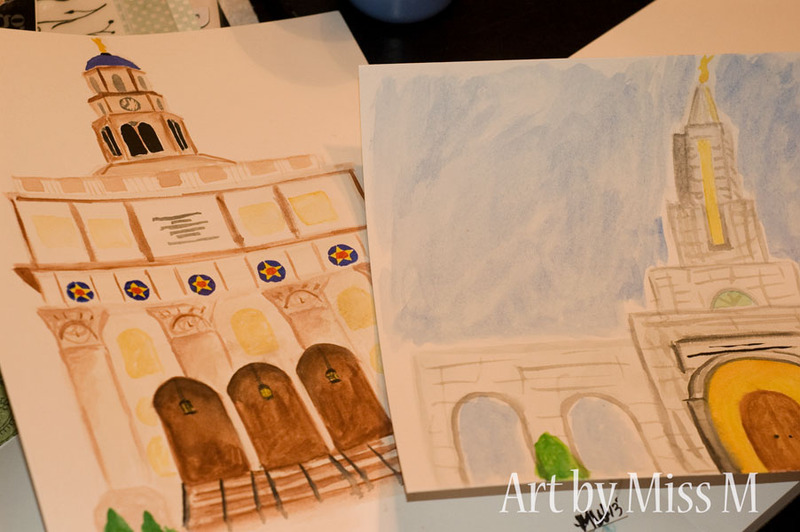 I dug out some of my stash and started a mixed-media project of my own. Have you done mixed-media before? It's fun! Mine didn't get finished so I'll show you the rest later but here's the some-where-in-the-middle stage. And, another cool thing happened later on. We were still crafting when the others returned home. They saw us in action and joined us. For two hours me and my 3 girls crafted around the table together each of us doing our own thing while laughing and talking together. 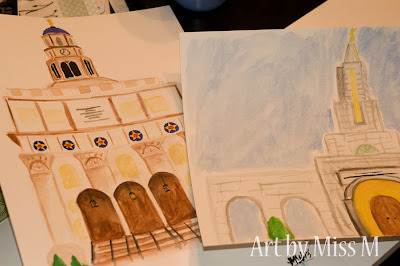 Jet made Valentine's stuff and Miss M started water-color painting pictures of LDS temples. A favorite day in my book of motherhood. Art from the HeArt!! LOVE THIS! !